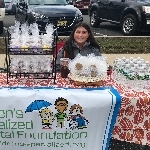 Welcome to my fundraising page, my name is Jessica and I am raising money to support the patients and programs of Children's Specialized Hospital. I found out about Children's Specialized Hospital after my little brother was hospitalized for pneumonia last winter. We saw a lot of very sick children and we were very lucky that my brother has healed and was able to go home. This holiday season I want to raise money to donate back to help other children who are sick and need to be at Children's Specialized for their care. I hope you will consider donating to help me reach my goal!! Your donation will help children like Izzy, click the video above to learn more about her story.